It's true, mama keeps giving me them but I just hop away. I don't think she's got the message yet! Will you let her know that I'm not fond of them? Thank you! Awww, he is adorable. I miss my bunny so much! Haha how cute! My sister's rabbit only like the carrot tops so we have to buy those ones and eat the carrots ourselves haha. I love Ralphie posts! Can't believe you have a bunny who doesn't like carrots though! Mae says send them her way; she might be a cat but she LOVES carrots. They are full of sugar, I think bunnies prefer broccoli and cabbage! I absolutely love this haha, he looks so grumpy! His grumpy face is just adorable! 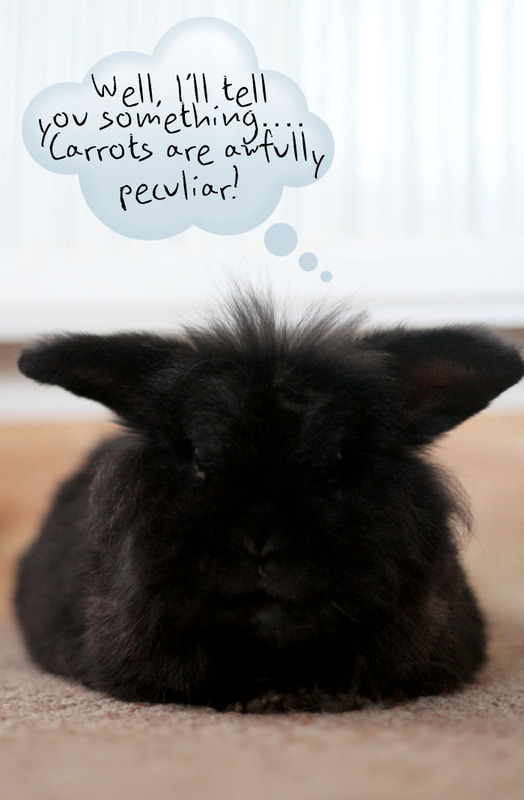 I work for the SSPCA and they told me that carrots to rabbits are like e-number sweeties to toddlers! They find them really sugary and go hyper! Ralphie must have a savoury tooth instead :-) Or he's watching his weight.